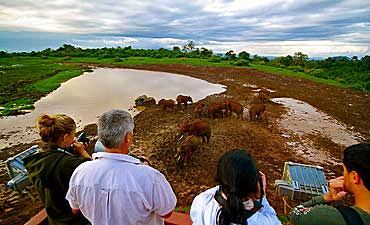 Want An Adventurous Safari In Aberdare? 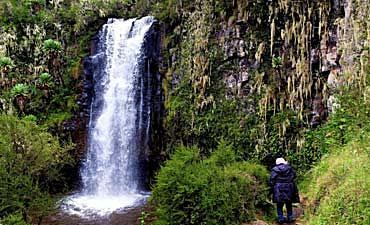 Scroll Down For Activity Details..
As the third uppermost highlands range in Kenya, the Aberdare Mountains (read where to stay) offer a distinctive tour of Africa’s pristine bush areas. 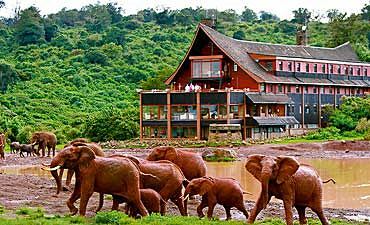 The combination of thick woodlands and lush green hilltops offer vast views of Mount Kenya and the Great Rift Valley. Running north to south for more than 100 km (60 miles), the volcanic range has two prominent peaks – Ol Donyo Le Satima and Kinangop. Several rivers flow through ravines that cut into the landscape, and in several locations, the water cascades down cliff faces in the form of powerful and phenomenal waterfalls. In the highest altitudes of these mountains is Aberdare National Park with a total area of 296 square miles (767 square kilometers). The unique high altitude habitats of the park support a variety of large and small mammals, many of which you may see during a game drive. Elephants, rhinos, giant forest hogs, warthogs and other grazers are most easily observed, but hiding in the deep grasses are leopards, spotted hyenas and other elusive predators. Two of Africa’s rarest species are found within the park as well – medium sized reddish-brown bongos and African golden cats. Half-day and full-day game drives are available via AfricanMecca, and you may opt for more than one game drive as both the moorlands and salient deserve at least a half day each at the very minimum. The park also boasts of over 250 avi-fauna species, including six of the eight restricted range species of the Kenyan Mountains Endemic Bird Area. The leisurely pace of a walking safari in the park improves your chances of sighting the feathered inhabitants. When you spot one of these species, watch for unusual behavioral displays, such as the aggressive tactics that are used by Tacazze sunbirds to guard food sources against other birds. Your birding skills will come in handy to identify African green ibises, Cape eagle-owls, eastern double-collared sunbirds and other winged denizens. The most memorable part of your birding safari in Aberdare Park might be sighting vulnerable species, such as Aberdare Cisticola, Sharpe’s longclaw, Hunter’s Cisticola, Striped Flufftail and Jackson’s Francolin. The private conservancies outside the park offer special safari excursions for your nature-centric trip in the wilds of magical Kenya and many of which are not authorized within the park. You can go horseback riding in the Aberdare Country Club Nature Sanctuary, and this location is also a great alternative for birdwatching and nature walks. Solio Ranch is a private rhino sanctuary that is globally known for the protection of successful breeding of black and white rhinos. AfricanMecca Safaris can arrange visits to the sanctuary with an overnight so that you may be enlightened about the vital work, and game drives can also be arranged within the private lands of the ranch. Sundowners are a long-standing tradition amongst seasoned safari travelers, and we can arrange these sunset excursions for you. From the top of Kamatongu Hill, you relax with a refreshing cocktail and watch the setting sun paint the African skies in deep rich colors.